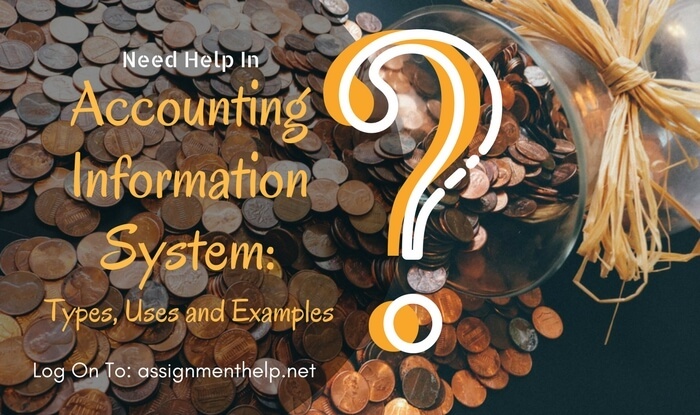 Accounting information system is a system which collects, stores and processes financial and accounting data that are used by the decision makers. It is a mixture of accounting data and information technology. The data provided by this system is used by the managers, accountants, consultants, business analysts, auditors and regulatory authorities. In other words, it is a formal process for collecting data, processing the data into information and distributing that information to its users. Main objective of AIS is to provide the management with enough information so that they can make decisions on the basis of it. Resulting information can be used by the internal sources like managers, CFO, CEO and also the external users like investors, creditors who are one of the important parts of the business organization. Accounting information system is designed in such a way which supports all the accounting functions and activities including auditing, financial accounting & reporting, managerial accounting and taxation. Traditionally people used to do accounting on a manual basis. In manual approach, skill and knowledge of an accountant was very important. And due to the presence of Human Element, it was ineffective and inefficient. Due to huge amount of data, accountant used to fully occupy with these things that he could not get time to make decision. Then Accounting Information System arrives, which resolves the issues that was faced in manual approach of accounting. It supports an automation of processing large amount of data and produce timely result and accurate information. In 1970, it was designed for payroll function. It was developed in house and was expensive and difficult to maintain. Therefore, people preferred manual approach to get rid of the cost. Today so many software like Oracle, SAP and etc. are sold as prebuilt software where it is configured and customized to match the organization’s business processes. Today, Cloud-based accounting information systems are increasingly popular for both SMEs and large organizations for lower costs. With adoption of accounting information systems, many businesses have removed low skills, transactional and operational accounting roles. 1) Efficient and Effective Collection of Data- Earlier, there should be manual approach of accounting which makes it difficult for the managers to record each and every transaction in the book. It was more like a boredom for the accountant but due to the establishment of the Accounting Information System, accountant do not need to keep tones of files to keep their data. What they need is just a system which stores the accounting data of the organization. 2) Supply Information- Second important function of AIS is to supply the information that could be used to make decisions. Financial statement, managements report is procured through accounting information system which helps the manager in the future course of action. 3) Adequate controls- Accounting Information System make sure that the data provided by the accounting information system is reliable. And also ensures that the business activities that are performed are according to the management’s objectives. And it also safeguard’s management assets. Security- Access of the data and system should be limited to the authorized persons only. Confidentiality- Data should not be disclosed to any unauthorized party. Privacy- Collection, storage of data of the customers should be done in an appropriate manner. Processing Integrity- The accurate, timely and complete processing of data done with proper authorization. Availability- The system is available to meet operational and contractual obligations. a) Speed- Main benefit of information system in accounting is the speed. Data entered once can be reused again and again. And can be used in compiling reports by just pressing a button. Even a correction can be done in just a few seconds and reports can be generated at a speed which is impossible in manual accounting. b) Safety- Once the data entered into the system, it becomes safe. Chances of losing of data are removed especially when you perform regular backups. In manual accounting, data can easily be manipulated and can be lost. But it is not the case in computerized accounting; it cannot be touched by any unauthorized person. c) Automation- Since the calculations are handled by the software, it eliminates many boring and time-consuming process which were there in manual accounting approach. d) Accuracy- Accuracy of the data is improved as the calculation is done by the software only, so chances of getting wrong information is eliminated in the process. e) Efficient- Accounting information system is efficient in a way that it saves time and also the resources in saving the data. In manual accounting approach, accountant need to maintain heavy files with him but in accounting information system, they do not need to maintain files and whenever they require any data; they can simply login to the computer. 1) Learning the system- Accounting information system mainly comprises of recording and storing of data in a system. So, for that employees need to get training. This is once again a costly and time-consuming process. 2) Loss of Information- Information is always recorded on the computers. Because of this, there is always a risk of losing the information through system crashes. 3) Health Dangers- Excessive use of computers may lead to many health problems such as headache, back pain etc. which reduces the efficiency of the employee and also increases the cost of medical expenditure on the side of employer. People- People are the users of Accounting Information System. Accountants, consultants, business analysts, CFO and auditors are the examples of users of accounting information system. An AIS helps the different departments within a company work together. For example, management can establish sales goals for which staff can then order the appropriate amount of inventory. The inventory order notifies the accounting department of a new payable. When sales are made, sales people can enter customer orders, accounting can invoice customers, the warehouse can assemble the order, the shipping department can send it off, and the accounting department gets notified of a new receivable. The customer service department can then track customer shipments and the system can create sales reports for management. Managers can also see inventory costs, shipping costs, manufacturing costs and so on. Procedure and Instructions- It is the methods AIS uses for collecting, storing retrieving and processing of data. Methods can be both manual and automated and the sources are internal (employees) as well as external (customers). Data- Data refers to the financial information pertaining to a business organization. Any information related to the finance of the business must go in the accounting information system. Example of Data- Sales Order, Customer Billing statements, Sales analysis reports, purchase requisition, vendor invoices, inventory data etc. This data can be used to prepare financial statements like profit and loss accounting, balance sheet trial balance and so on. 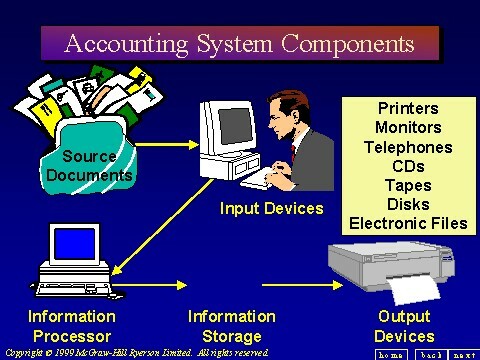 Software- Software components on AIS is the computer programs used to store, retrieve, process and analyze the computer financial data. Before this approach, manual method was prevailing to store and collect the financial data of the company. But now, almost all the companies are using software to store, collect and procure the accounting data. Quality, Reliability and Security is the key component of the software. Managers rely on the information it provides to make quality decisions. Information Technology Infrastructure- It is nothing but the hardware that is used in the process of accounting information system. Hardware items include- personal computers, printers, servers, routers, storage devices etc. In addition to cost, factors to consider in selecting hardware include speed, storage capability and whether it can be expanded and upgraded. Most important is the compatibility of the hardware with the software. Software must be compatible with the hardware. A good accounting information system includes a plan for maintaining, servicing, repairing and upgrading the hardware. Internal Controls- Internal controls refers to security measure taken by the organization to preserve the data. This can include a password or even biometric identification. AIS not only contain the information of the organization but also of its customers and employees. Credit card numbers, pay slips etc. is included in this. Internal control is needed to protect the data from the virus, hackers and internal and external threats to network security. Output- It refers to the information generated by the Accounting Information System in the form of reports. Output includes profit and loss account, balance sheet, ledge accounts etc. Manual Systems- Manual accounting information system is generally used by small business firms and home-based companies. If a system is entirely manual, it would require source documents, general ledger, general journal. Legacy Systems- Legacy systems are often in existing business firms and were used before information technology got as sophisticated as it is today. It is an old-fashioned accounting information system but still it has got some advantages. A legacy system has actually been customized to the specific needs of individual firms. It also has some disadvantages. They have no documentation. Usually replacement parts are hard to find because hardware and software becomes obsolete. Replacement of Legacy System- Legacy system can be replaced with the up to date system. It is an expensive solution of the problem but you can always update your system. You can use a procedure called screen scraping, which is a technique that takes the data displayed on the computer screen and translates it so a newer application can read it. You can also set up an enterprise application integration system. This type of system networks the different applications in your legacy system, such as inventory, payroll, and others. a) Measuring the performance of various business operations. a) Information provided by accounting is generally used for creating budgets. a) It is commonly used for making decision of the business. a) External users often use this data to make investment decision. b) Managers can make use of information provided by ratios after the information provided by Financial Statements. b) Past data tells the company about the expenditure of the company. b) AIS provides cost of various operations and thus these can be compared with the return from these operations. b) Banks and other financial institution reviews company’s accounting information to check the financial soundness. c) Ratios can be compared with ratios of other company or industry standard. c) Business owners develop future budgets on the basis of the information to ensure healthy financial route. c) High Cost and Low income is often rejected and Low Cost and High income is accepted. c) Inability to provide the external environment with information may limit the finance. 1) Account Mate- Account Mate develops and markets fully modifiable business accounting software. Systems range from single user versions to those that support hundreds of users simultaneously. Account Mate software is available for local installation or as SaaS. 2) CYMA- CYMA Accounting Software provides the perfect accounting software solution for growing mid-sized businesses through flexible user environments, a full suite of useful accounting software modules, robust reporting, industry leading security, and advanced customization options. 3) Intacct- Intacct is a cloud financial management company. Intacct accounting software, in use by more than 7,300 organizations from startups to public companies, is designed to improve company performance and make finance more productive. Hundreds of leading CPA firms and Value-Added Resellers also offer Intacct to their clients. 4) Red Wing Software- Red Wing Software develops and distributes accounting and payroll software for small to mid-sized businesses, agribusinesses, municipals and nonprofits in North America. Center Point Accounting has many convenient, time–saving features such as pop–up reminders, quick lists, keyboard commands for “heads–down” data entry, and the ability to skip fields to speed up entry. 5) SAP- SAP provides the right foundation for your accounting and reporting teams. Their financial accounting solution unifies robust financial accounting functionalities to help you manage the complexities of your company's global accounting and reporting requirements – for greater efficiency and transparency across the enterprise.